A Soyuz space capsule carrying two Russian cosmonauts and an American astronaut cast off from the International Space Station and began the journey back to Earth Sunday (Sept. 16), wrapping up a four-month stay in orbit. The Soyuz TMA-04M spacecraft carrying NASA astronaut Joe Acaba and Russian cosmonauts Gennady Padalka and Sergei Revin undocked from the station at 7:09 p.m. EDT (2309 GMT) as the two spacecraft flew high above Nairobi, Kenya. 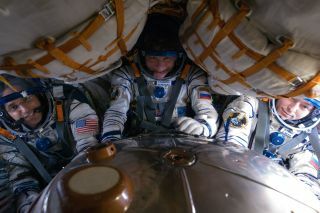 The trip back to Earth will take nearly four hours, with the Soyuz expected to land in the steppes of Kazakhstan at 10:53 p.m. EDT (0253 GMT Monday), though it will be just after sunrise at the landing site, NASA officials said. The Soyuz's departure brings the space station's Expedition 32 to a close. Padalka commanded the expedition, while Acaba and Revin served as flight engineers. Padalka handed the orbiting lab's reins over to NASA astronaut Sunita Williams, commander of the new Expedition 33 crew. Space station Expedition 33 commander Sunita Williams (facing camera) hugs outgoing Expedition 32 commander Gennady Padalka during a farewell ceremony on Sunday, Sept. 16, 2012, before Padalka and two crewmates returned to Earth after five months in space. Expedition 33 will be a three-person operation for about a month. Williams, Russian cosmonaut Yuri Malenchenko and Japanese spaceflyer Akihiko Hoshide have the station to themselves until mid-October, when the arrival of three new astronauts will bring the $100 billion orbiting complex back up to its full complement of six crewmates. Acaba, Padalka and Revin launched toward the station on May 14 and arrived three days later. The astronauts' four-month stint marked the first long-term stay aboard the orbiting lab for both Acaba and Revin. Padalka, however, had lived on the station for long durations during two previous missions and commanded the outpost's Expedition 32 crew. It was his fourth mission and third time in command of the space station.